After Toy Fair, it seemed like 2016 might be a year without any GI Joe. We are glad to finally report that that's not the case! Fluent in several languages, Duke graduated at the top of his class at Airborne School, Fort Benning. Calm and determined, he commands by winning respect. He turned down a battlefield commission because it would distance him from his troops - and keep him from the center of the action. When he faces Cobra leader Tombstone, he meets a foe who is his equal in rank and combat skill - and a psyops warrior without equal in the art of terrifying enemies into surrender. While it's nice when toys create their own fictional worlds, especially in the face of the absence of any kind of other offical media, but putting it directly on the filecard like that is not the way to do it. Leave the filecards for info about the characters alone, and then put a blurb on the back of the packaging or something, you know? I get that after 50 Dukes (literally: Hasbro has released 50 Duke figures prior to this one) it's hard to find something new to say, but you've got to try. As you'd expect, Duke is built entirely from reused parts. Between the arms and legs, his outfit is kind of thick and baggy, making him look like he's ready for cold-weather missions. His vest covers a surprisingly narrow torso (taken from movie Breaker, who also hid it behind a vest, albeit a different one), so you'll want to leave that on: the chest looks out of place when it's exposed. 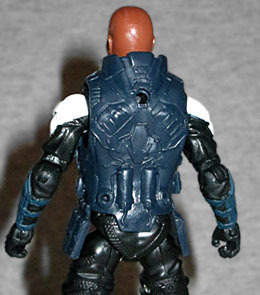 Unfortunately, like so many GI Joe vests and jackets, it doesn't want to stay pegged shut properly. The head comes from Pursuit of Cobra "Desert Battle" Duke (the one with the rocket launcher and plasma cannon), which is a nice mold even five years later, if a little small on the body. For some reason, Hasbro opted to paint Duke's shirt yellow, rather than the more tradtional tan - he still passes "the squint test," but you've got to squint pretty hard. Duke's weapons come from "Jungle Assault" Duke: he has a pistol, an M-4 assault rifle, and a M249 Paratrooper SAW. He also gets a backpack that's black with a single green panel in the center. We really miss having a holster for the pistol, as simple a thing as that is. Tombstone is a mysterious, high-ranking member of the Cobra organization. He strikes fear in his enemies through a combination of strong tactical leadership and cunning psychological manipulation. His battlefield brilliance engenders deep loyalty among Cobra troops. When he faces Conrad "Duke" Hauser in battle, he meets his equal in leadership and skill - and finds a warrior who does not succumb easily to mind tricks and phantom terrors. Ah, now here's why you want to buy this set! Tombstone, the Cobra psy-ops specialist, is 100% a new character. He isn't from any of the cartoons, he isn't from any of the comics, he isn't from any of the games or movies... he is someone created whole-cloth for this toy with no backstory beyond the 66 words quoted up above. We've said before that if you only rely on nostalgia and never create anything new, you're in trouble, and Hasbro is at least trying. It's one thing to create new kinds of Vipers, but it's entirely another to create a named individual. Tombstone gets a new head, unmasked because he doesn't care who knows who he is. The sculpt makes him look like Tiny Lister, though instead of just being blind in his right eye because of a deformed and detatched retina, he's got big scars there that suggest a history of violence. While the head is cool, the body seems a little plain for a named character. 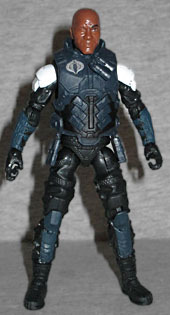 We get that he had to be built from reused pieces, but he's just one helmet shy of being generic cannon fodder. Even the colorscheme - blue and black with a touch of white - makes him feel like a Trooper who took off his mask when it was time to eat lunch. The majority of his body is taken from "City Strike" Firefly, while his forearms and biceps come from two different sources. He certainly feels like a Cobra, and he certainly feels like somebody who would be out in the field, but he doesn't feel quite as unique as he should. 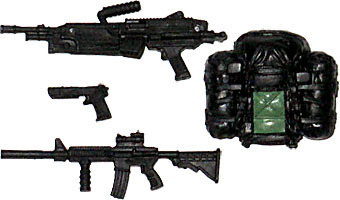 Tombstone is armed with the triangular HISS Drone gun, an HK G36 assault rifle, a Rise of Cobra energy rifle, and a gas-powered rifle originally seen with the Retaliation Cobra Trooper. None of the guns can store on him in any way - holsters, pegs, etc. - so at best, two of them are always going to be laying on the ground. They do all look good in his hands though, and make him appropriately threatening. Duke is, like this year's Scarlett, a new design that takes cues from the original without being an update of it. 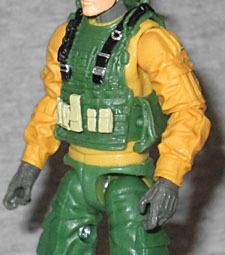 A lot of people were hoping for a straight update, like Gung-Ho or Lady Jaye, but if they'd gotten his colors right this would have been tops. And while Tombstone is a little less unique than we might like, it's still great that Hasbro is pushing things forward rather than just resting on the past.